We have become renowned as the go-to specialists and practitioners when expert solutions for mine rehabilitation, tailings environmental challenges, dust control, waste water management, ecological improvement and final mine closure practices are sought after. Our specialised team crafts site–specific solutions through the full value chain of our discipline, from engineering design to implementation and maintenance of our solutions. As part of our partnership approach, we offer a one-stop shop for the environmental rehabilitation and improvement needs of our customers. Philosophy – At Agreenco we believe in outstanding service. We therefore strive to continuously exceed expectations through constant evaluation and communication regarding our proposed course of action to reach our customers’ final objectives. As we have a share in the success of the outcomes, we follow a partnered approach. To this end, we only consider ourselves successful, once we have delivered to our customer an environmental return on investment. Approach – Driven by our passion for continual improvement and best cost-of-ownership solutions, our sole objective is to deliver exceptional environmental results. As we understand the business case of our customers’ environmental risk management requirements, we develop and implement our projects accordingly. However, the specific outcomes are first and foremost defined by the needs of our customers. Mission – Leading Mine Environmental Rehabilitation Practice: Scientifically, Economically, Sustainably. Our History – Over the past 20 years, Agreenco has grown from a classical university start-up company to a leading role player in the environmental services domain, and our brand has become synonymous with demonstrable environmental improvement in the South African mining industry. Today, our services are sought after by virtually all of the Blue Chip mining companies. We believe that our success can be attributed to our foundation in environmental engineering as well as the natural and agricultural sciences coupled with the recruitment of dedicated and well–qualified personnel. We pride ourselves on our track record of more than 200 large–scale projects across all commodities and virtually all environmental challenges that are common to the mining industry today. As we understand the dust mechanics of haul roads and the associated risks of these for mining operations, we are able to offer the lowest cost-of-ownership dust control applications in the market. 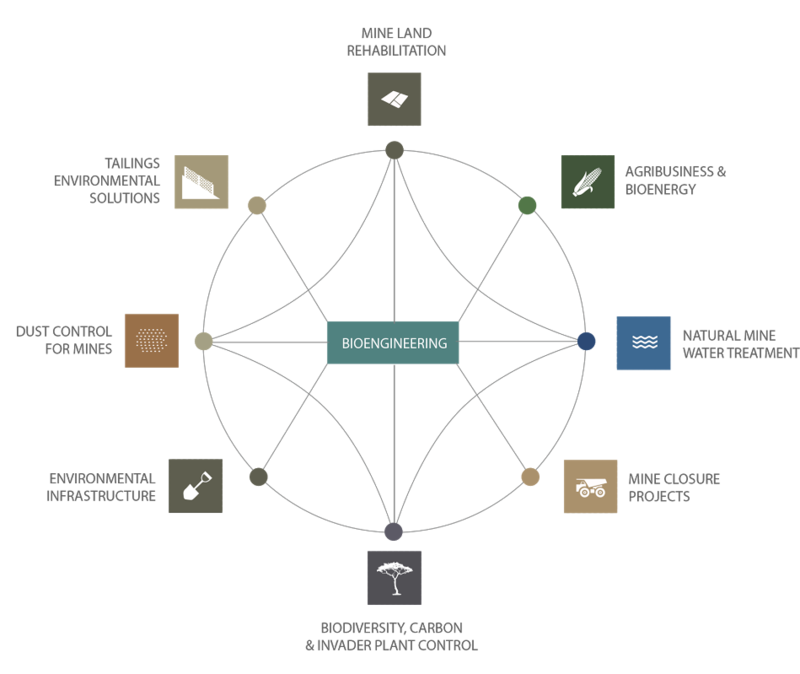 We understand the prerequisite of a scientific approach to land rehabilitation, we are able to develop, implement and manage the complete value chain of land rehabilitation with closure in mind. We specialise in taming the environmental impacts of tailings including dust control, seepage treatment, rehabilitation, biodiversity impacts, spill management as well as closure of decommissioned facilities. At Agreenco, we are able to unlock the substantial opportunity that mine-owned agricultural land offers to restore viable agribusiness and secondary down-streaming of agronomic potential. At Agreenco, our engineers design, build and operate natural water treatment systems, often in combination with civil infrastructure, where nature has the capacity to attenuate the water quality. We have developed a unique risk based approach to deal with environmental remediation design, applied air and water quality improvement expertise, and realistic end land use options. We offer a wide range of services to ensure a safe post mining landscape, to protect the natural environment and to beneficiate the remaining environmental resources as part of economic value creation potential. At Agreenco, we are passionate about assisting our customers with novel biodiversity solutions, which consider carbon management. We protect biodiversity and optimise this asset during the life of a mine. At Agreenco, we strive to ensure that nature and industrial activities co-exist through our signature environmental designs and track record of consciously green, expert implementation.